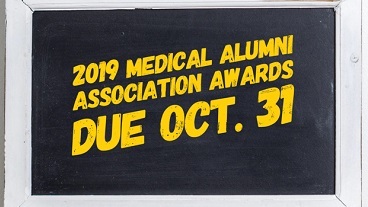 The Wayne State University Medical Alumni Association invites nominations for the 2019 Distinguished Alumni, Lawrence M. Weiner and Recent Alumni Award. The awards will be presented on Medical Alumni Reunion Day on May 18, 2019. All School of Medicine alumni, faculty and resident alumni are invited to nominate candidates. A letter of nomination should be submitted addressing the nominees' achievements in relation to at least one of the criteria and is to be accompanied by the nominee's current curriculum vitae. The award committee will select finalists. Submission of materials may be emailed to lramos@med.wayne.edu or mailed to WSU Medical Alumni Association, 540 E. Canfield, 1369 Scott Hall, Detroit, MI 48201.